The minister of East African affairs, Shem Bagaine has revealed that citizens of the East African Community (EAC) member states will start receiving the regions electronic passport next year. “Citizens of the member states will start receiving and using the regional E-Passports next year after the EAC summit meeting, putting a stop to the use of national passports,” he said. Bagaine said the use of a common E-passport which is globally recognized, will make travels within and without the EAC region easy and fast. He was speaking during the crowning of the EAC week and marking of the 16 years of regional integration since inception in 1999. 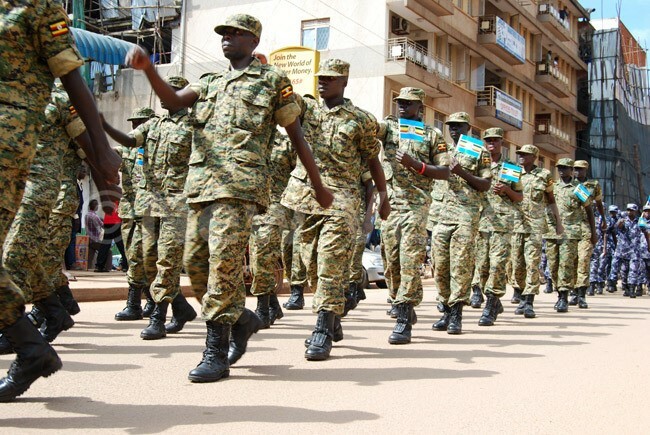 The celebrations were held at CHOGM grounds after marching from the constitutional square, through Luwum Street to Entebbe road and then back to the main grounds. He said though they agreed that citizens of member states can use their national Identity cards to travel across the EAC countries, the electronic passports will enable them travel safely across the globe. In 2014, the council of ministers in charge of the EAC affairs and planning in their meeting in Arusha, Tanzania, adopted a design and a roadmap of issuing a common e-passport. The ministers agreed that the e-passport be made in colors of the EAC flag which is green or sky blue and red with text and national emblems plated in them. It was also agreed that the travel document be only valid for 10 years. On Friday, Bagaine said that the e-passport is one of the many significant achievements that the EAC region has had. Others are having a single customs territory, a common market and the removal of trade barriers such as taxes on produce from within the member states. He revealed that the EAC is in the process of setting up a national Swahili council in Uganda since it is the Kiswahili language, which is the agreed regional language is less spoken. Bagaine pointed out that they have already done a pilot study in 68 schools across the country where the language is being taught and are planning to roll out the Kiswahili curriculum to all the schools, with emphasis that the lessons be started in primary one. He said that for those who are already done with education, a system will be put in place to ensure that they access Swahili lessons and also be evaluated. However, Justice Geoffrey Kiryabwire of the East African Court of appeal said that the region still has a long way to go to achieve a full integration. He said that there is need to improve on the basic infrastructures such as education, energy, transport and tourism. “Economic fundamentals need to be given due consideration for our economies to become vibrant and successful. There is need to implement adequate tax and social security reforms as well as contribute to the expansion of the private sector, create jobs and increase productivity,” Kiryabwire, who was the chief walker, said. The judge who also doubles as the Ugandan court of appeal judge said that the region also has to put up strong regional and national institutions in order to fight the corruption scourge. (L-R) Uganda’s EAC affairs permanent secretary, Edith Mwanje , Chief walker Justice Geoffrey Kiryabwire of the Court of Appeal and State Minister of EAC Affairs and Regional Integration, Shem Bagaine matching during the celebration of the East African Community Week at the CHOGM grounds Kampala on December 04, 2015. (Photos by Godiver Asege).